Upon the retirement of former Executive Director, Roxane Leopold, the Board of Directors launched a scholarship fund in 2007. This interest of this endowed fund is intended to defray tuition costs for King Street Center alumni who are full-time students in college or other post-secondary training programs. Gifts have ranged in size from $500-$2,500. The deadline for applications is May 15. Personal essay, transcript & two letters of reference (please also refer to VSAC scholarship booklet) should be mailed or emailed directly to Kelli Shonter at kelli@kingstreetcenter.org. The Teen Futures program provides middle and high school youth the opportunity to develop their interests and learn new skills as part of a close-knit, caring community. Job Club, which teaches young people about the value and importance of work through job readiness training, resume writing, and career exploration. 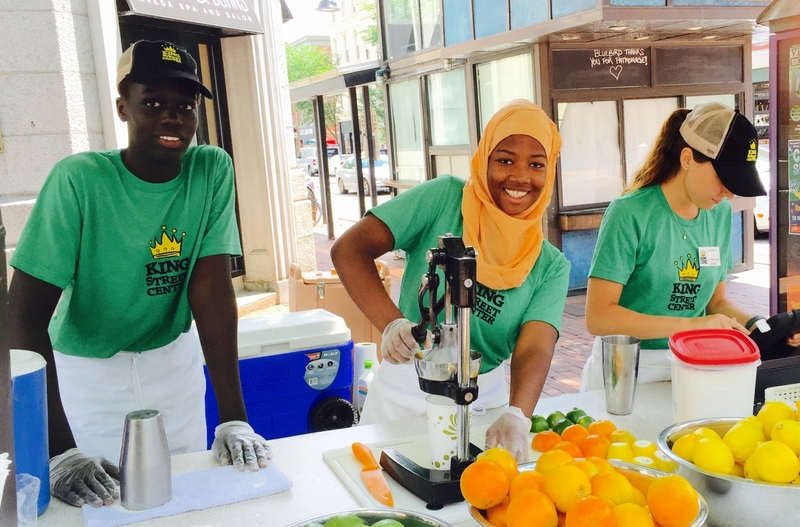 Job Club graduates work each summer on the King Street Lemonade stand on the Church Street Marketplace. Academic Support, including supervised homework time completed at the center; computer and internet access; and one-on-one tutoring as needed. Teens are exposed to the many opportunities available to them after high school through field trip on college campuses, presentations, and one-on-one conversations with role models in the community. Healthy Choices, which includes Kids’ Café, where teens plan and prepare healthy meals together; athletic pursuits, including basketball, tennis, and Junior Milers running. Junior Senior Buddy Mentoring, allows teens to be matched with an adult mentor, as available. These pairs meet weekly, enjoying local community adventures. Teen Futures program hours are 3:00 – 6:30 pm weekdays during the school year. Full program offerings are also available during school vacations. Summer enrollment is open to teens who participate in the school-year programs only. Activities include working on the King Street Lemonade Stand as well as field trips and ongoing academic support. There is no fee for Teen programs. They are generously supported through corporate and foundation grants, as well as local community members. However, we ask that participants complete enrollment form here: Enrollment Form Teen Futures 2017.2018 release. For more information contact Joe Ruggles at joe@kingstreetcenter.org or call 802-862-6736 x110.